What Is The Relationship Between Food and Mood? Hypoglycaemia or low blood sugar levels – did you pick it? Now you don’t have to be diabetic or have insulin resistance to experience this: as a large part of it comes down to how well you fuel yourself. Understanding the relationship between food and mood is the key to avoiding some of these unwanted symptoms. When our blood sugar levels drop our body considers this is stressor and releases adrenaline and cortisol. These two fast acting hormones can lead to immediate personality changes. Heard of the term “hangry”? = hungry + angry….. most of us have felt it at some point: think of kids post a birthday party; there is usually a meltdown at some point between leaving with big smiles and bed time! This is a very real demonstration of the relationship between food and mood. Aside from all the emotional changes that take place there are a few crucial biochemical effects we would do best to avoid: high blood glucose levels are pro-inflammatory, lead to diabetes, and actually change the structure of the brain. Research has found that repeatedly raised blood sugar levels reduces the brains connections among regions of the brain involved in self-perception and emotions: so now we have structural changes taking place marrying up with the high levels of depression and anxiety associated with Diabetes. This fascinating research suggests that this change results in how we perceive and deal with things that stress us out: therefore decreasing our capacity to cope with stress and skewing our perception of situations; again amplifying anxiety and depression. Avoid foods that lead to high blood glucose: simple carbohydrates: low-fibre foods, most cereals, white bread, crackers, desserts, pastries, cakes, biscuits. These grains have had the germ and bran removed to make a finer flour and extend their shelf life but most of the nutrients are lost as well as the fibre – there is a direct correlation between food and mood here i.e. an increase in these foods and depression in adults and disturbed emotional function in children. Each meal should contain a good nourishing source of protein: remember protein isn’t just fish, chicken and meat: there are great healthy sources such as eggs, cheese, full fat Greek yoghurt, lentils, tofu, chickpeas (think hummus), quinoa grain also has a higher protein content than most grains. Complex carbohydrates such as whole grains (contains the bran, germ and endosperm of the original grain) are vital in managing the relationship between food and mood. Whole grains are either single foods, brown rice, buckwheat, millet, oatmeal, popcorn or barley or ingredients in products, such as buckwheat in pancakes or whole-wheat flour in bread and crackers. They take longer to metabolise, have all the nutrients and fibre for good gut heath and release the energy over a longer period into the blood giving us better blood glucose control therefore stabilising the mood. So, to keep energised, focused at work and have your best chance of dealing with daily stressors in a calm and objective fashion: make sure you start your day with a healthy breakfast. You should be aiming for something low in sugar and include a good source of protein and complex carbohydrates to stabilise and extend your blood glucose levels. If you’re not a big breakfast eater try a smoothie and add a good quality protein powder. 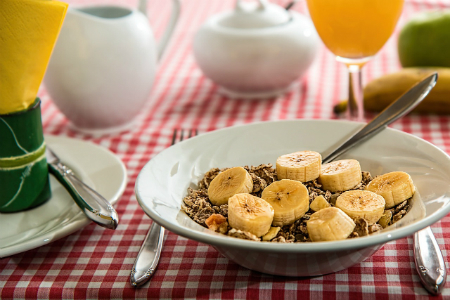 Breakfast sets the tone of the day: if you get that right you’ll be in a much better position to make healthy decisions as the day goes on and best of all when you get to the end of it you’ll be smiling and ready for some fun. If you’re struggling with ‘food and mood’ issues, experiencing any of the symptoms highlighted above and would like to try and understand what area of your diet may be triggering it, book an appointment with one of the professionally-qualified nutritionists at Perpetual Wellbeing today. We can help you with dietary analysis, dietary planning and lifestyle advice. What Is Pyrrole Disorder And What Are The Symptoms?